As we work with many industry experts, we noticed that the word “experience” was used more often than the usual, “event.” This made a lot of sense to us as new event marketing platforms and other technological innovations, like social media and other digital communities, create a much more comprehensive experience surrounding an event. 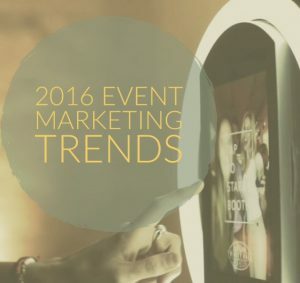 Rather than engaging attendees primarily at the event itself, these new technologies provide several additional opportunities to interact before, during and after an event. 2. The emotional connection between a brand and consumer is more important than ever. The relationship between a consumer and a brand is no longer as transactional as it once was. By providing consumers with engaging experiences in which they can actively participate and interact with the brand in some capacity, it increases the attendees’ likelihood to become more emotionally invested in that brand and the product or service it provides. This helps to increase important attributes of that relationship like brand awareness and loyalty. 3. Many event marketers understand the importance of proving event ROI, but aren’t quite sure how to get there. Many marketers are still unclear how they should begin proving their event ROI, including the key metrics to track as well as the different technology solutions available to do so. This is why our VIP GIF Booths come with an in built online social metric report which we share with clients a few days after the event. This is a great way to visually measure the online reach and impressions of using a GIF Booth for your campaign. 4. Data is KING & QUEEN! Collecting accurate data such as email, date of birth, mobile number and full name can be challenging. This data alone gives you the digital event marketer a greater udnerstadning on your audience demographic. Imagine being able to accurately capture all this data (or some of it!) in a way that is engaging, fun, addictive and more importantly SOCIAL? This coupled with a measurable way of proving your brand activation ROI will give you a pretty good idea how successful it went. 5. Brands have shifted from spending money on “stuff” to spending it on experiences. Brands have clearly been increasing their focus on event marketing as part of their larger marketing strategy as the larger consumer trend towards valuing experiences over “stuff” continues to increase and permeate our culture. Research has disproven a previously logical assumption that people made when spending their money: that because a physical object will last longer, they will make us happier for a longer time than a one-off experience like a concert or vacation. As a result, brands are starting to put more money towards experiences and memories. Well this is where our VIP GIF Booths come in to play! Have a look at our dedicated Corporate page which lots of great information on its digital marketing use for your brand activation campaign, experiential event and any other type of social interaction you have in mind.